More Sweetness...With a Crib Halo - Jill Ruth & Co. 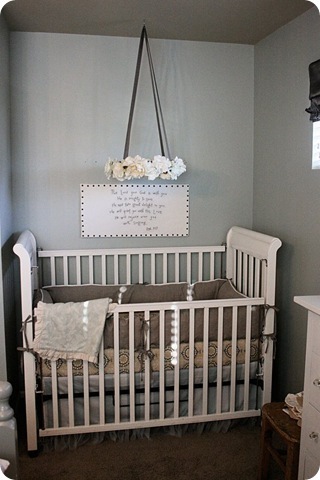 The wreath will hang horizontally, like this, above the crib. We decided we are officially calling this element a "Crib Halo". 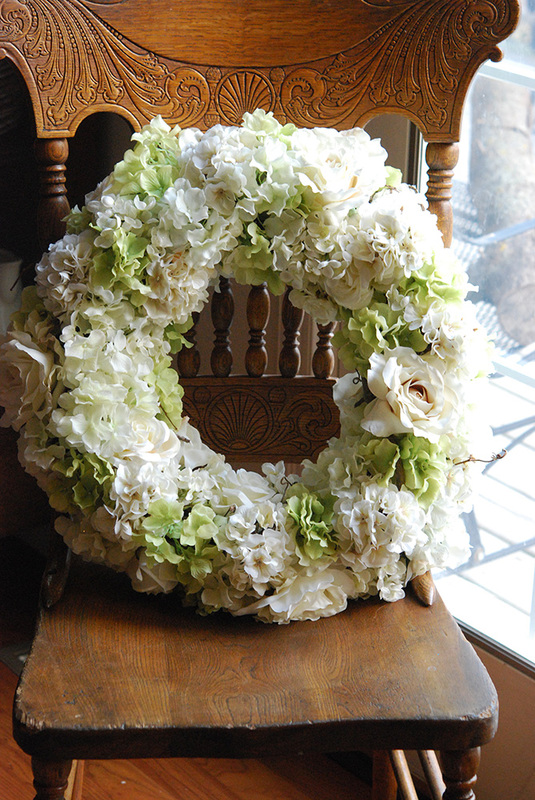 She used a grape vine wreath and hot glue to attach the flowers. For this wreath, I wrapped an embroidery hoop (again) with a strip of neutral fabric and then created the fabric roses with all neutral fabrics. 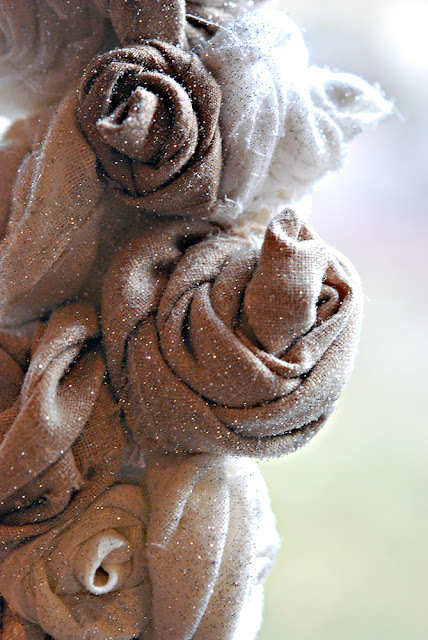 To make the roses, you fold a strip of fabric in half lengthwise and begin to roll and twist. All along securing with a low temp glue gun. When I got done, my daughter said, "Glitter. It needs glitter." She was right! A little spray adhesive followed by a generous sprinkling of silver glitter, and it was really pretty! You may be thinking that these sure aren't colors for a baby girl's room. Well, she's going for pretty and feminine not necessarily "baby". I think it's going to be wonderful. I hope to get to their house to take pictures of it when it's all done to show you. Her inspiration for these came from some shop online and they were selling the framed silhouettes for $160 each. She bought these frames at Target for $10 each then found free images online. She printed them out on just plain white paper, stapled it to black paper along the outside, then carefully cut out the silhouettes. It really only took her about 5- 10 minutes to cut each one out. These will hang 2x2 on one of the walls in the nursery. I love silhouettes and remember trying to draw my kids' silhouettes with a big lamp and white paper on the wall years ago. This was before all the digital abilities. I wasn't too successful. Ha! 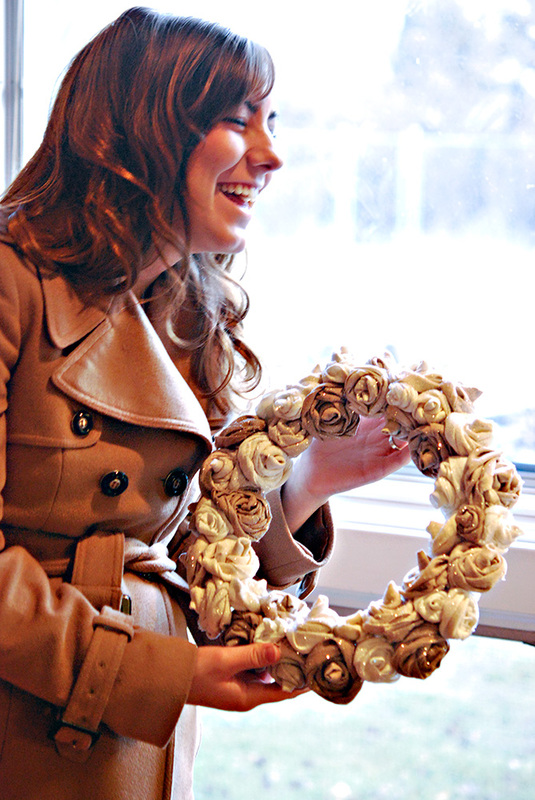 I love both wreaths!! So pretty. 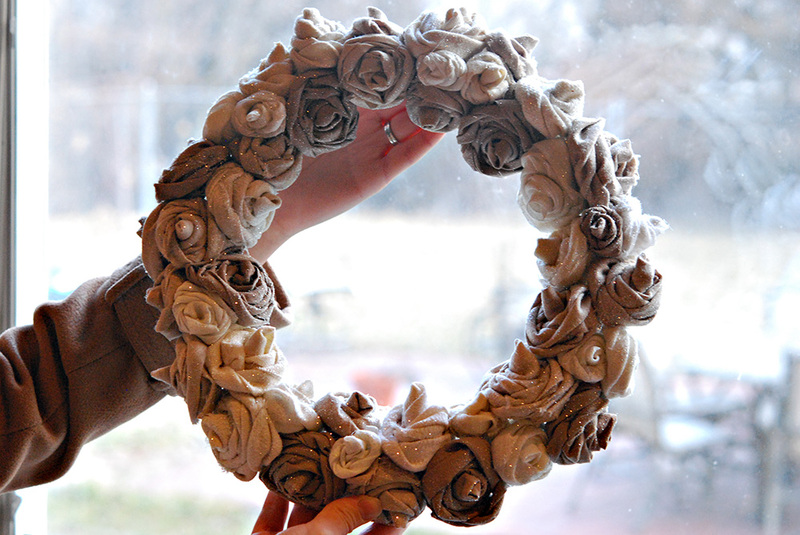 I really want to make one with fabric flowers. Just gorgeous! I also might try the fabric one. Both wreaths are so pretty. What clever women you are. Such beautiful wreaths that will mean so much. 2 very joyus occasions to celebrate! you two make a wonderful team!! Such lovely hand created pieces! love the halo !!! absolutely great idea ! also like the feminine, not baby look..will last much longer..and using the flowers from the wedding...just magical ! and the silhouettes...have to say..i too sat my kids in front of a wall with the bright light...haha..i have them from every couple years when my kids were little..isnt it wonderful how easy it is now?? Your wreaths are beautiful Jill. Your daughter is as talented as her mom. I love the silhouettes too. I believe this room will be amazing when all put together. A little glitter solves everything! Looks like you're off to a wonderfully creative start in 2012...the baby's room is going to be DARLING. 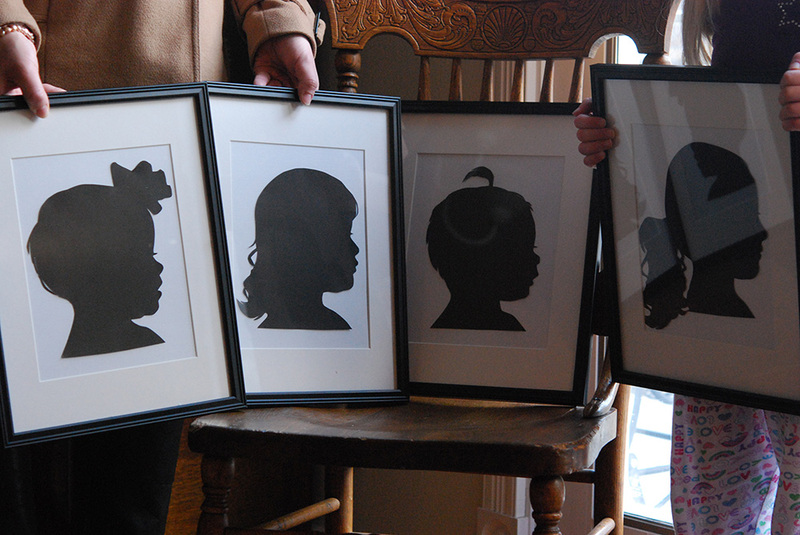 I remember having silhouettes cut at school, when we were small, as gifts for our Mom. ALL of it is fantastic!!! This is so much fun watching ya'll get ready for that much loved baby. The glittery rose wreath is so beautiful. Thanks for sharing! 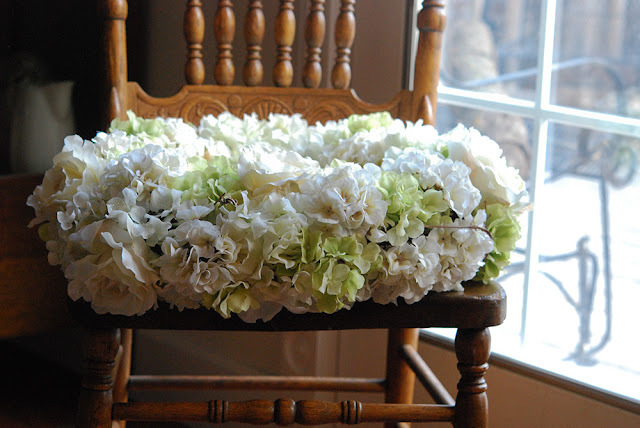 great idea for using the wedding flowers, love your wreath too! Can't wait to see more of the baby's room. Love the wreath! REALLLLLLLY love the silhouettes .... I love the way she made them... thanks for sharing!!! Happy baby! You two are amazing and creatively dangerous with hot glue guns! Both wreaths are brilliant!